I found several male Bobolinks engaged in countersinging in the middle of some farm fields for which I had permission to enter so I was able to get about 80 feet from them for this video. I was able to get 3 Bobolinks in the lens view as they were close together as they engaged in the aggressive territorial auditory and behavioral display. They sand for more than 5 minutes with a few collective pauses as they fluffed up their feathers and engaged in various aggressive poses. Though only 3 Bobolinks are seen at one time the voices heard on the video are of a total of 9 Bobolink that sang in this location, all within 40 feet of each other so they came through nicely. Occasionally a Western Meadowlark, also perched nearby, is heard singing. 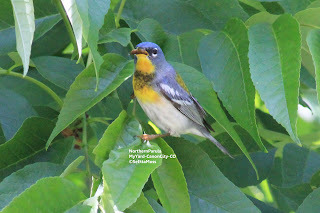 The Northern Parula I found in my yard this afternoon was kind enough to show off it's very yellow throat and black band across it as shown in top pic. In the bottom pic the bird was going after the fat worm seen in the photos on the previous post and what a very yellow mouth it has. His green back shows well in this photo as do his white eye crescents. Yesterday I was pleased with the mini-fall out in my yard of neotropical migrants though none was rare at all. This morning all that remained were the Gray Catbird and the buntings that have been here for a week or so. So I birded the Canon City Riverwalk (actually I live less than 500 feet from the greenbelt that is the bluff over the Riverwalk) but no sign of the Yellow-rumped Warblers that visited my yard last night. 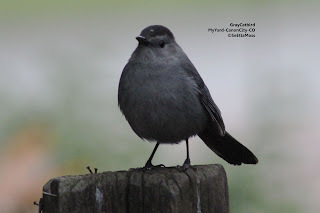 A number of years ago a pair of Gray Catbirds nested right under my dining room window--what wonderful intimate views I had. 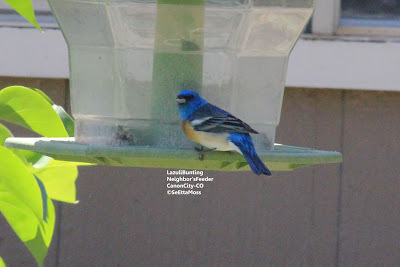 Unfortunately I had to clean up the very overgrown shrub in which they nested so they haven't nested in my yard since but do come to visit--well, they come to eat here anyway. And the male, or males, engage me in countersinging--or I engage them. 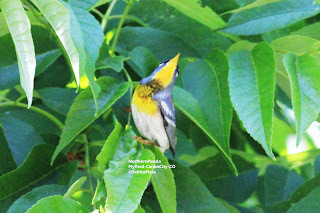 This afternoon we had a strong storm with some small hail and a half inch of rain--afterwards there was a mini-fallout of birds: a female Rose-breasted Grosbeak and 2 male Black-headed Grosbeak; 4+ Yellow-rumped Warblers (more than I have seen on our Riverwalk all week); several singing Yellow Warblers; 2 Broad-tailed Hummingbirds; two male and 1 female Lazuli Buntings and 1 male Indigo Bunting (that have been around for a week); a few Pine Siskin that should have gone to breeding territories; and the pair of Gray Catbirds.